Kindle is an Amazon’s Wireless Reading Device, developed by Amazon. It is an embedded system for reading electronic books (e-books). Kindle uses an electronic paper display and downloads. Wireless connectivity enables you to shop the Kindle Store directly from your Kindle. It also provides free internet access to Wikipedia. Kindle utilizes Sprint’s 3G high-speed data network. You can read in sunlight with no glare. Main adavantage is there is no monthly wireless bills, data plans, or commitments. Amazon pays for Kindle’s wireless connectivity so you won’t see a wireless bill. You can simply click, buy, and read. Utilizing a new high-resolution display technology called electronic paper, Kindle provides a crisp black-and-white screen that resembles the appearance and readability of printed paper. The New York Times, Wall Street Journal, Washington Post, TIME, Forbes and other major newspapers and books will be auto-delivered wirelessly. 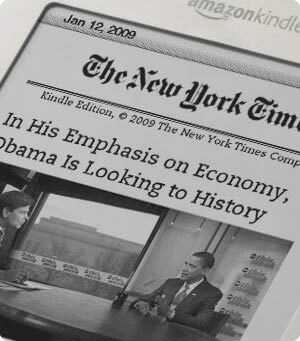 Amazon announced latest version of Kindle called Kindle 2 in February 2009. What is the Battery Life on a Kindle?